I’m not a huge egg fan by any stretch of the imagination, as my family will attest, but today seemed like a good day to make them for a brunch. Our church service was at 0900 instead of later in the morning this week, so we went before breakfast and ate afterwards. If I’m going to eat eggs, they need to be amped up a bit so I don’t taste the egg too much. I add lots of veggies and cheese and then serve with toast and some fruit. (Today the fruit was clementines). Prepare the garlic, pepper, mushrooms, and cheese. Set aside for the moment. Crack the eggs into a medium bowl and add a 1/4 cup water. Mix thoroughly. An immersion blender works wonderful! Heat a non-stick pan over medium heat until a drop of water spatters. Add 1-2 Tbsp of olive oil and/or butter and heat again. Add garlic, pepper, mushrooms and tarragon. Sauté until soft – about 3-5 minutes. Add the eggs to the pan and then top with the cheese. Let eggs cook for a half minute. Then with a rubber or wooden spatula, gently push the eggs from the side to the center of the pan. Continue until there is no liquid left. 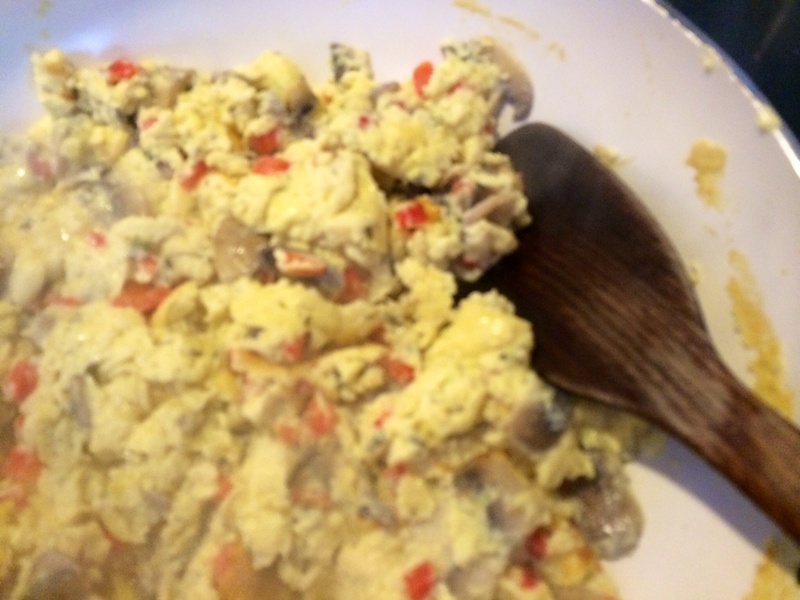 (I find the eggs get fluffier when I add the cheese at the start of cooking). Sprinkle the truffle oil over the top of the eggs. This is optional, but it does give a delicious umami/earthy flavor to the eggs that I absolutely adore. 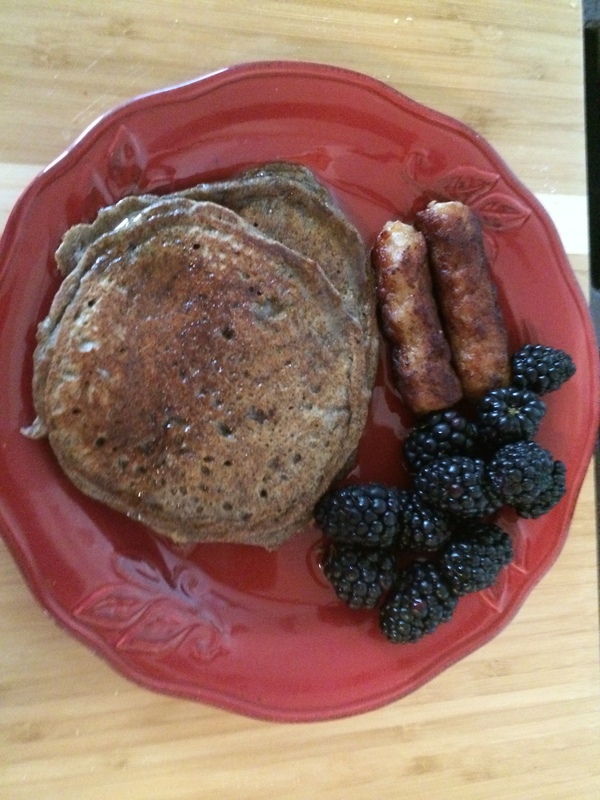 Serve with toasted whole wheat bread and fruit. Haven’t written anything for awhile. Have lots of recipes and no time :-(. Anyway, thought Id get caught up a bit by posting a basic smoothie recipe we like. I could have smoothies every day for breakfast! Here’s one I really like… and it’s definitely adjustable with a variety of fruits. Put all ingredients together in a small bowl. Grate about 1/8 tsp nutmeg over mixture. Using an immersion blender, mix the ingredients until smooth. Pour in a large cup or glass – or if you wish, put in two smaller cups for 2 servings. Grate some more nutmeg over the cup. NOTE: I leave the lemon and mango out 5-10 minutes before proceeding with grating/mixing. The lemon grates better if left out a few minutes and the mango blends better if slightly thawed. Variations: There are lots of variations on this. I will often use frozen blueberries or mixed berries as the fruit and then use cinnamon for the spice — using about 1/2 tsp. cinnamon in place of the nutmeg. A friend uses frozen peaches and raspberries. If no yogurt, you can use milk in it’s place if desired. I’ve left the whey powder out and added more yogurt and that works just fine too. Don’t believe there are any hard and fast rules for smoothies. Use your imagination and enjoy! 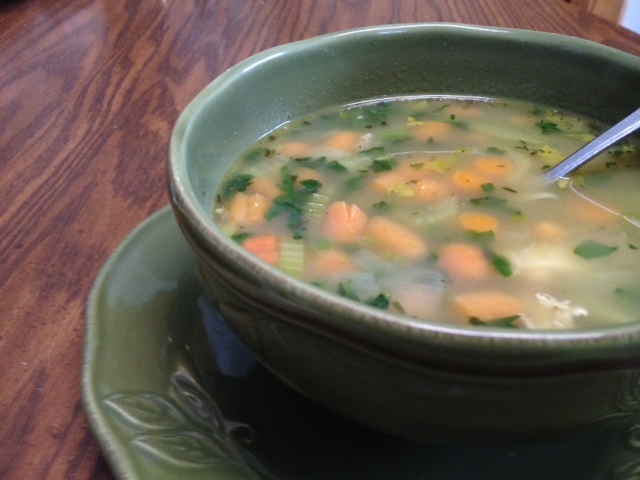 I published a chicken soup recipe awhile back here that I’ve made for years. These past few months I’ve found a new way of making chicken soup that is much faster to put together and tastes pretty darn good! My son has been “into” brining poultry after we brined a turkey for Thanksgiving last year. He uses a recipe where uses equal amounts of kosher salt and sugar boiled to completely dissolve and then cool. He then puts two chickens in a large container with the brine and refrigerates over night. The next day he rinses the chickens in cold water, applies an herb run and roasts them. This is absolutely delicious and there is leftover chicken for salads, sandwiches and soups for a week for three of us. Maybe I’ll get more details later and publish a full blog on Brined Chicken! You can use any type of chicken you have available for this soup, however. 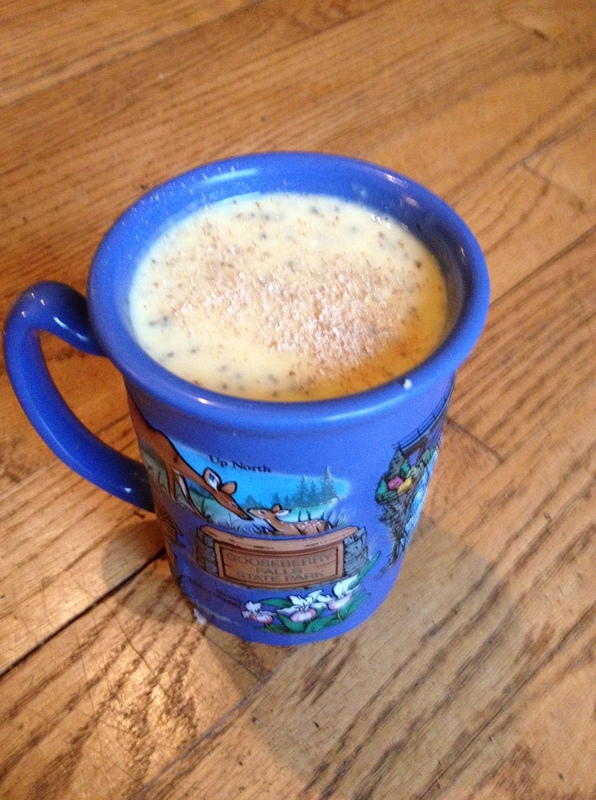 8 cups chicken broth (I use 2 – 32 oz. boxes of broth – or make your own broth as noted in my original chicken soup recipe). 1 pkg frozen spinach (10 oz) – I’ve also used fresh chopped bok choy or baby spinach. Leave the spinach out for a couple hours to thaw if possible, but not necessary. Heat the olive oil in a soup pot. Add garlic and sauté briefly. Add thyme, red pepper flakes, onions, carrots, and celery. Sauté until just tender – 7-10 minutes. While veggies are sautéing, warm the chicken broth in another pan until almost boiling. Add this to the original soup pan and bring mixture to a low boil. Add bay leaves. Rinse the barley in warm water for a minute or two. Add this to the broth mixture. Bring soup back to low boil and simmer until barley is done. This usually takes 35-30 minutes. Add the spinach and cook until it is thawed or add the fresh spinach or bok choy. Add chicken and parsley. Cook until hot. Let simmer a few more minutes to meld flavors. Serve with bread, crackers and/or a simple lettuce salad. Enjoy. I used to make yogurt occasionally when the kids were younger and I had a “real” yogurt maker of sorts. It always seemed to be too much “putzing” to be worth the effort. I recently heard about making yogurt in a crockpot and I was intrigued. So I did some research on the Internet and came up with a method that worked for me. There are numerous variations out there and you will need to find one that fits into your workflow. After a few adjustments, this is the method that works for me. Homemade yogurt is awesome! It has a smooth, mellow taste and I can eat it by the spoonful without any sweetener. Pour the milk into a saucepan and heat until 185 F. (Some versions call for putting this in the crockpot and heat til 185, but I find it’s faster to heat in a pan first. You may also want to add a cup of powdered milk to make it thicker, but I never have it around, so don’t put it in :-). Pour the milk into the crockpot and cool to 110-115 F. This may take an hour or two. I leave the cover off and put the thermometer in the crockpot to monitor. Remove 1-2 cups of milk and transfer to a small bowl. Add the 1/4 cup of yogurt and whisk to mix. 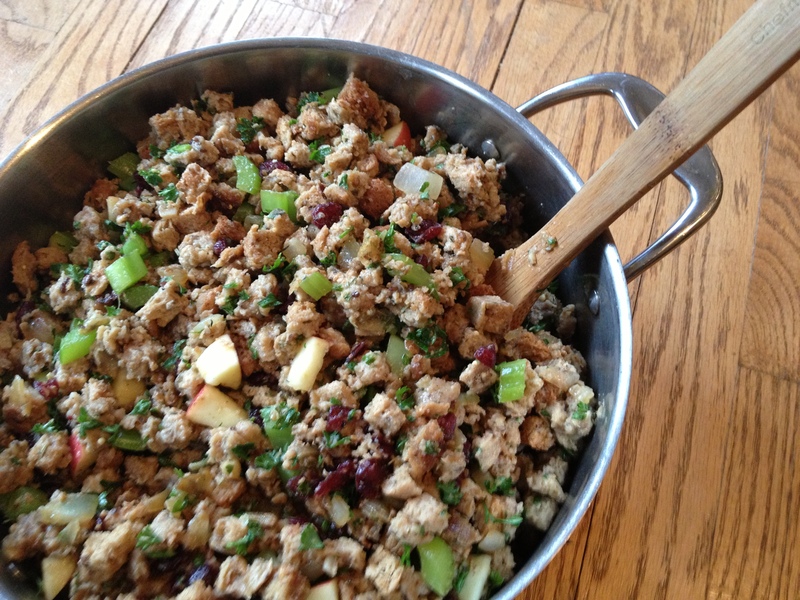 Add mixture back into crockpot and stir. Remove crockpot from oven. At this point you can remove the base container from the crockpot and refrigerate until later or strain the yogurt to remove the excess whey to make it Greek yogurt. To strain the yogurt, place a damp thin, white, cotton kitchen towel or several layers of cheesecloth in a colander. Place the colander over a bowl. Transfer the yogurt to the lined-colander. It may take an hour or two to strain the yogurt if using a towel (which is what I do). You will have a cup or two of whey which can be saved to use for baking. It can be substituted for buttermilk in recipes calling for this. Once the yogurt has drained, place it in jars or glass containers and refrigerate. This makes 2 ping jars. Enjoy!! 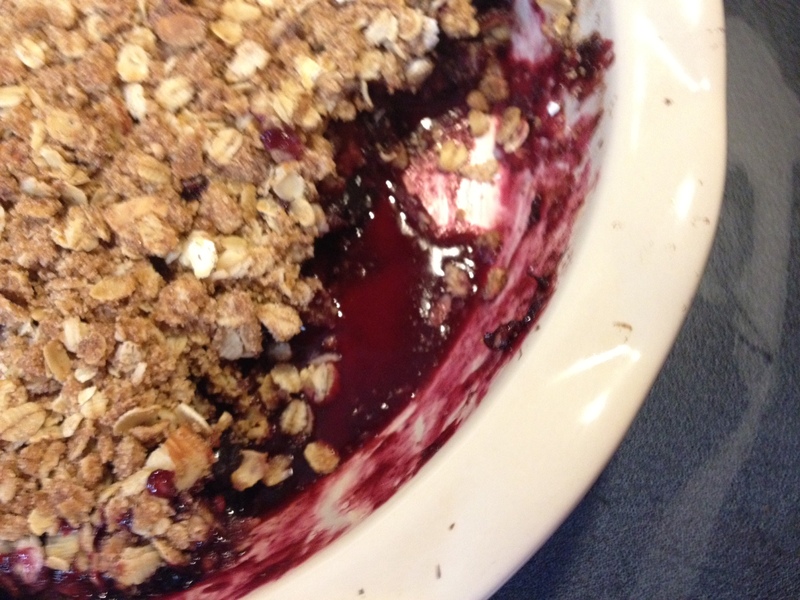 I serve this with fresh or frozen berries and sometimes my homemade granola on top.